If you are planning a charity event and would like Joy Home for Children to be a beneficiary, please get in touch. 100% of the funds you donate will be spent on the children. You can also decide what you would like to fund from our charity needs list. 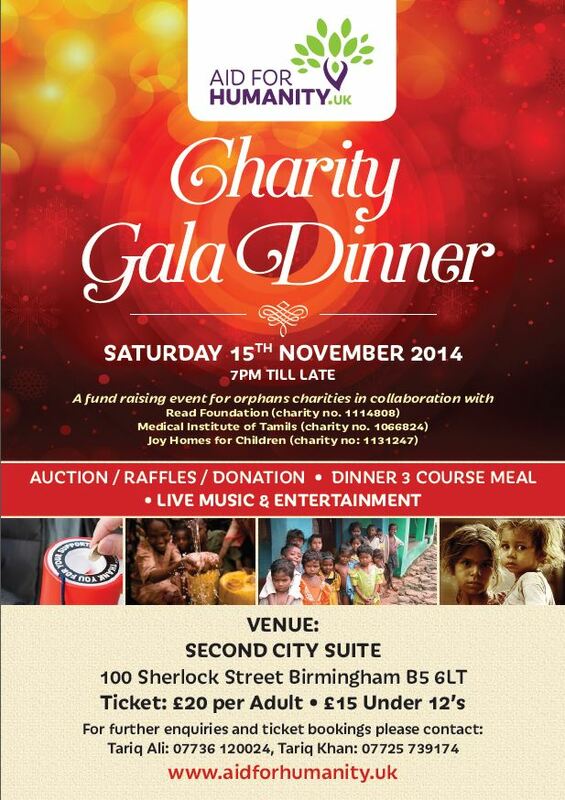 Charity Dinner - 15th November 2014. Aid for Humanity Charity Gala raised a record £2,338.33 from this charity fundraiser. Thank you to all those who supported us in this amazing event. Fabric Sale Fundraiser - August 2011. A fourth fabric sale raised £258! These funds have been allocated to the instalation of a new direct electrical supply. Fabric Sale Fundraiser - May 2011. A third fabric sale raised £180! These funds have been allocated to the shortfall in food and grocery shopping as well as building maintanance. Fabric Sale Fundraiser - April 2011. A second fabric sale raised £90 plus an additional £28 was raised from items made by Kavae, Sophia, Cameron and James from the fabric. Thank you Angela and her family for their fundraising and to Mr. Hussain for providing the materials. Fabric Sale Fundraiser - December 2010. Angela, Malcolm and their children Kavae, Sophia, Cameron and James arranged a fabric sale in Ringwood, Hampshire. They raised a fantastic £230! Thank you to all those for coming along supporting Angela and raising so much money for our orphanage.